The question put to President Trump at a White House news conference on Wednesday with Prime Minister Benjamin Netanyahu of Israel was pretty straightforward. An Israeli reporter wanted to know about the rise of anti-Semitic incidents in the United States and concerns that the new administration was encouraging xenophobia and racism. For a normal American politician, the moment offered a perfect opportunity for a home run. Condemn the behavior and make a sincere pledge to do everything possible to stop it. There is no question that hate crimes and malicious speech have accelerated since the presidential campaign, with Jews among the prime targets. The Anti-Defamation League says anti-Semitic talk in the United States has reached levels unseen since the 1930s. And there have been bomb threats against Jewish centers across the country. Mr. Trump, alas, is not that politician. He lacks the principles and moral understanding that most Americans want to see in their presidents. In fact, his answer summed up just how far we have traveled from normal. As is so often the case, he began with a focus on himself and skirted the issue. It was as if his brain had short-circuited or someone had hit some internal replay button in his brain. Mr. Trump went on to promise to “have peace in this country” and to “stop crime,” which could mean stopping hate crimes, but could just as easily mean a crackdown on speeding. As for racism and anti-Semitism, he said “bad things” have happened “over a long period of time” and gave no hint of appreciating how his nationalistic, anti-immigrant policies and fear-mongering have been a dog whistle for the alt-right. This is the same man whose White House recently issued a statement on Holocaust Remembrance Day that said nothing about the six million Jews who perished under the Nazis. 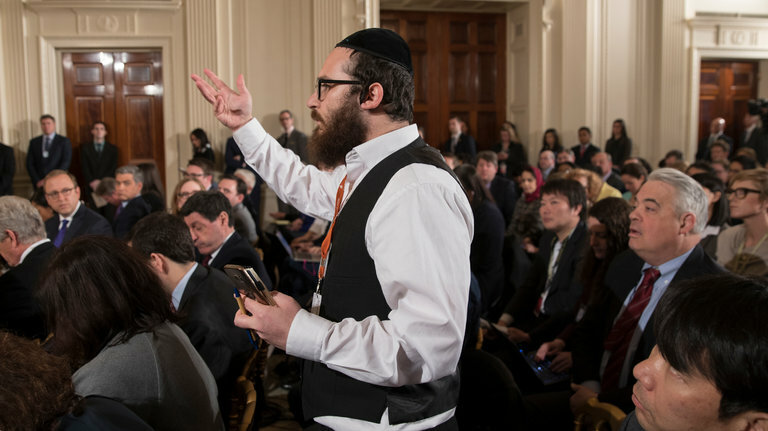 Mr. Trump’s abominable answer to the anti-Semitism question on Wednesday drew considerable criticism in the Israeli press and elsewhere, so it shouldn’t have been a surprise when a different reporter reprised it at another news conference on Thursday. Mr. Trump derided the question as “very insulting.” Then he played his ace card by invoking Mr. Netanyahu, who one day earlier awarded Mr. Trump his personal imprimatur and political cover by declaring “there is no greater supporter of the Jewish people and the Jewish state” than the new American president.